SHARE this page with others - Click on the blue-coloured text to access pages! Read Excerpts from the Narcissism List!!! Visit the Archives of the Narcissistic Abuse List! 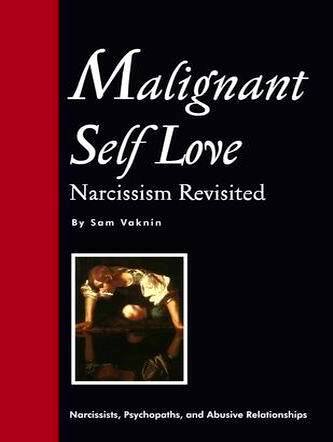 My book, "Malignant Self Love  Narcissism Re-Visited" was written under extreme conditions of duress. It was composed in jail as I was trying to understand what had hit me. My nine years old marriage dissolved, my finances were in a shocking condition, my family estranged, my reputation ruined, my personal freedom severely curtailed. Slowly, the realization that it was all my fault, that I was sick and needed help penetrated the decades old defenses that I erected around me. This book is the documentation of a road of self-discovery. It was a painful process, which led to nowhere. I am no different  and no healthier  today than I was when I wrote this book. My disorder is here to stay, the prognosis is poor and alarming. I wanted to talk to others, to compare notes, to learn and to support by disseminating knowledge. This is why I established this group. Its archives are by far the greatest resource available on the net regarding pathological narcissism and the narcissistic personality disorder. Every day, between 3-5 articles are posted to its members and contributions from listmembers are welcome.